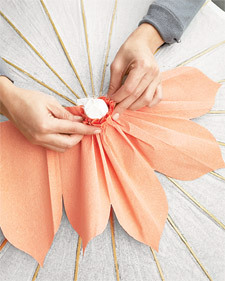 Your tiniest attendants will positively bloom thanks to these posy-topped rice-paper parasols. Dresses, $145, Coren Moore. "Flavia" Shoes, by Little Raggio from Penny's From Heaven, $89. Parasols, 28", $5.50 each, Cultural Intrigue, lunabazaar.com. 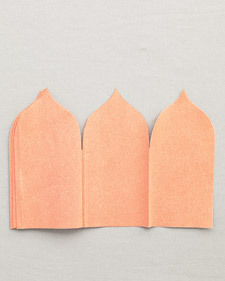 "Doublette" crepe paper, $2.50, Castle in the Air. 1. Download our petal template and print it onto a letter-size sheet of paper. 2. Accordion-fold crepe paper 8 times, folding every 4 1/2 inches. Trace template onto the crepe paper. 3. 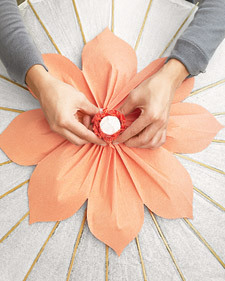 Cut along the traced line through all the layers of the crepe paper to create the petal tips. 4. 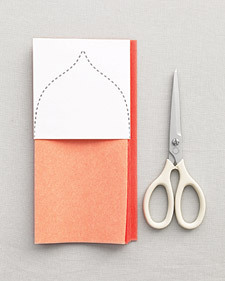 Unfold the crepe paper completely, making certain not to tear it, and lay it flat. 5. 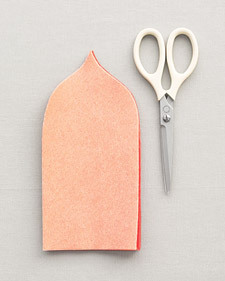 Wrap the flat edge of the crepe paper around the cap of an open parasol, cinching it as you work. 6. Secure the gathered crepe paper around the cap using a rubber band or a thin strip of pretty ribbon.